Milwaukee artist Tim Meyerring is a big fan of President Barack Obama and wanted to send him a gift to show his appreciation. But it turns out that giving a present to the first family isn’t that easy. Meyerring works in the Marshall Building, 207 E. Buffalo St., and his work has sold well for Crate & Barrel. His “Earthen Abstract” was the top selling work for the company for seven seasons in a row. The company sells photo reproductions of Meyerring’s work and he keeps the original, hoping it will rise in value. “Earthen Abstract,” he says, has been appraised at $30,000. But as the presidential election approached last fall, Meyerring decided he wanted to make a gesture. “I wanted to show my appreciation to the president for what he’s done in leading the country, for all the work he’s done in an absolutely volatile set of circumstances,” the artist says. But Meyerring didn’t hear anything for months. “I sent it regular post, no insurance, no signature required.” He began to think it had been lost in the mail. Then in late February, he received an email from the White House assessor, thanking him for the gift and asking the value of the painting. Meyerring, surprised, replied, estimating the painting’s value was in the ballpark of $5,000 to $10,000. The assessor then replied, explaining that under the law, the president cannot accept any gift worth more than $350. Did this mean the president was going to pay the difference or had the letter somehow been released without knowledge of the assessor’s consultation with Meyerring? Meyerring just wanted to give a gift and now he’s confused by the whole chain of events and waiting to hear more. The only thing he knows for sure: giving a present to the president can be a very complicated affair. Correction: an earlier version of this story incorrectly reported that Meyerring had sold the painting to the president. We apologize for the error. Judge Jean DiMotto tells Plenty of Horne she plans to retire in May, at which time she will undergo surgery, which has been a commonplace event in her life recently. She plans to spend her recuperation “readin’ and writin’” she says. To get her started, she has begun a website, which features her writings and offers for sale a database of firms that purchase creative non-fiction writing. [This $20 investment that will repay itself after an aspiring writer sells a half-dozen or so articles, so what’s holding you back?–Ed.] Her book “Mind in Search of its Moorings” is due out this summer, once her gavel pounds its last verdict. She can then either donate her judicial robe to charity or just leave it in the closet for her husband, Judge John DiMotto to wear. Judge John was busy today, Wednesday, March 13th 2013 from noon to 1 p.m. when he hosted the Judicial Forum at the Milwaukee Bar Association headquarters, 424 E. Wells St. There are three judicial seats on the ballot this season, but only one contested race, between Rebecca Bradley, a recently appointed incumbent, and her challenger Janet Protasiewicz in Branch 45. However the other two unopposed candidates will pop in to introduce themselves, just to be sociable, before they disappear from sight. 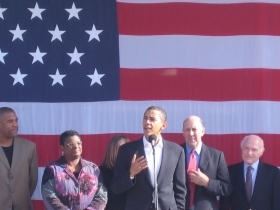 In case you haven’t met them, William Pocan is the incumbent in Branch 26 (and the brother of a congressman!) while Branch 11 has only one contender, a lucky guy named Dave Swanson. Swanson made some noise about running against the incumbent Dominic S. Amato, but it never came to that when Amato announced he would not run again. If all $128,600 per year jobs were that easy to get! But lest you think judging is all about benches and gavels and robes, it is worth noting that judges are members of the “Bar” after all, and on occasion even visit the types of bars that admit regular folks. Sure enough, it was judgefest inside the tavern, with such noted jurists as Daniel A. Noonan, David L. Borowski, Rebecca F. Dallet, John J. DiMotto, Paul R. Van Grunsven, Stephanie G. Rothstein, Pedro A. Colon, Dennis R. Cimpl, Carolina Stark, Glenn H. Yamahiro and Mary E. Triggiano representing Milwaukee County Circuit Court. They were joined by Judge Derek C. Mosely and Phillip M. Chavez, who bring in big bucks for the city imposing fines in municipal court. A couple of Milwaukee police officers stood inside the doorway at Rosie’s, but their presence seemed unnecessary, since all of the judges behaved themselves quite nicely. Jake’s Delicatessen [“since 1955”] which opened a second location at the Shops of Grand Avenue in December seems to be doing well in the downtown mall. Indeed, the corned beef joint plans to move to the third floor food court from its current location in a little hole in the wall on the second floor. This should be good news for the hungry as well as for the other restaurants there. I was a participant, and a woefully inadequate one, in its inaugural “Bash o’ Corned Beef” sandwich eating contest on Friday, March 8th 2013, when I managed to consume fully two corned beef sandwiches (1 pound!) in a span of ten minutes that seemed an eternity to me. The winner consumed eight in the same period. But it was fun, I was full, and it was great to hear the news of the success of the restaurant at its downtown location. Jake’s still keeps things busy at its 1634 W. North Ave. location. Changes have been few, says Rob Frost, the Director of Guest Services (how did Jake Levin ever get along without a Director of Guest Services?) yet include some kitchen remodeling and expansion. But no messing with the ordinary stuff that people like so much there, and find so familiar. … Also at the Grand Avenue, Evan Pack says management has extended his lease for his Vulture Space bicycle collective for another year. The Wisconsin Artisan Food Producers Association hosted its inaugural “Taste and Learn” event at Kasana — The Gallery, 241 N. Broadway March 9th, 2013. The event drew perhaps 50 attendees (at $35 apiece) to taste the free samples and learn from a schedule of classes. This sort of event has become increasingly popular in this food-and-drink-obsessed city. The association was founded in 2012 to “promote, advocate for and otherwise support artisan food and beverage producers in Wisconsin.” Russ Klisch of Lakefront Brewery was there with his wife May Klisch and their two daughters, making this a family affair while pouring samples of his many beers, including Local Acre, brewed with all-Wisconsin ingredients. Across the hall, Guy Rehorst offered samples of his Great Lakes Distillery products. He said he tried making gin with local juniper berries once, but they just didn’t have any flavor. And he used the good, wild ones. Oh, well, Wisconsin can’t produce everything. Next to Rehorst, the folks from Purple Door Ice Cream offered samples of their product, made with whiskey from Great Lakes Distillery. Things have come to a pretty pass when you need an ID to have an ice cream cone! Julie Waterman of Indulgence Chocolatiers offered samples of her wares, while Rob Henningfeld of Clock Shadow Creamery showed that cheese made in an urban setting, like his “Quark” brand, can be mighty tasty, indeed. Bolzano Artisan Meats offered a flight of sausages, including one that was simply cured Berkshire Pig, with no flavorings, smoke or spices. It is remarkable how much different that was than the typical commodity hog that you and I slaughter for everyday use. Fun Fact! Bolzano, 3950 N. Holton St., is located in the building that housed Great Lakes Distillery when it was a startup firm. So, you see, our artisanal industries already have their synergies. Isn’t that what community is all about? Chicago artist Michael Valenti has issued a limited edition poster to commemorate Midwest BikeShare, which has raised a third of the $1.5 million it needs to begin a bike share program here. [See “Funder’s Network, etc.” Urban Milwaukee, January 2013]. The poster will be unveiled Thursday, March 21st at 5 p.m. at the offices of Hanson Dodge Creative, 220 E. Buffalo St. The related exhibition will run until May 30th. The organization hopes to have 25 kiosks and 250 bicycles to rent in place by this summer. Midwest BikeShare was founded by Barry Mainwood, owner of Mainly Editing, Inc. and Foley & Lardner, LLP attorney Bruce Keyes and is assisted by Juli Kaufmann, developer of the Clock Shadow building, who hopes to find a location for a bike hostel somewhere in the city. I will be giving a free address on the “Bicycle History of Milwaukee” today, March 13th at 7 p.m. at Shakers Cigar Bar, 422 S. 2nd St.
Milwaukee played an important role in the development of the modern bicycle, with such firms as C. J. Smith & Sons (now A. O. Smith), Andrae (now Terminal Andrae Electric) and Johnson Services Co. (now Johnson Controls) all getting into the racket in one form or another. Many of these businesses were located on S. 2nd St. (as is Shakers), which went by the name “Reed Street” until 1930. Depending on my success in scoring a projector, this will be a visual feast. In any event, I will have illustrations to pass around. 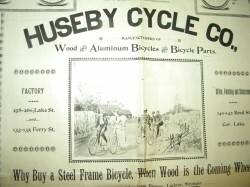 A special treat will be an 1896 newspaper advertisement for the Huseby Wooden Bicycle made just three blocks north of where I will be speaking. This artifact is kindly on loan from Michael Gerlach, who might be induced to play a tune or two for the lucky guests. A rare bamboo Huseby bicycle dating from 1896 is the centerpiece of the collection of the Milwaukee Public Museum, which has kept it and scores of the world’s most important bicycles in basement storage, inaccessible to the public, for nearly a half-century. I will be talking about that, too, you can be sure! I’ll get there just after “work” (5-ish) and look forward to seeing you! I am so dissapointed I will not be able to be at your Horne Bicycle speech. I am going to begin sending the Obamas one piece of original artwork per week, just to mess with their heads. And I’m glad Meyerring went with his first choice, “Horizon Aire,” instead of his ‘plan B,’ “Window To the Obamas’ Souls.” Fortunately, either works.